Those four stacks are all one hundred twenty (120!!) 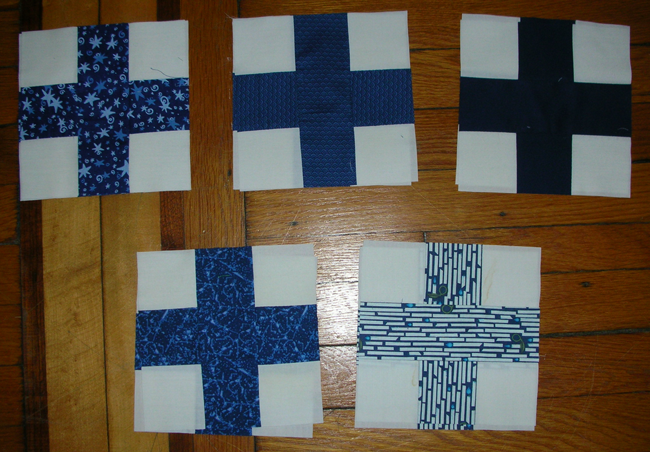 blocks for my adapted-to-double-size Simple Math quilt. There are four widths of crosses: 1″, 1 1/4″, 1 1/2″ and 2″. 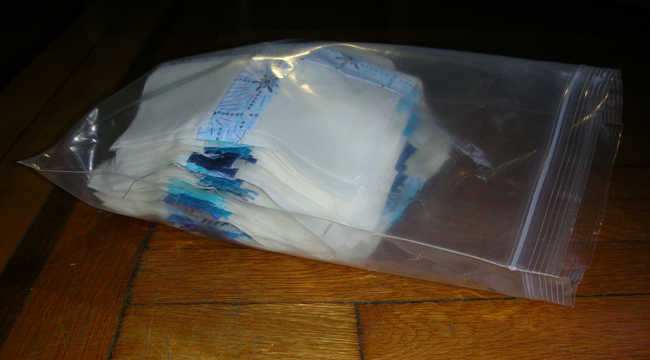 There are fifteen fabrics total, and two patches in each width in each fabric. 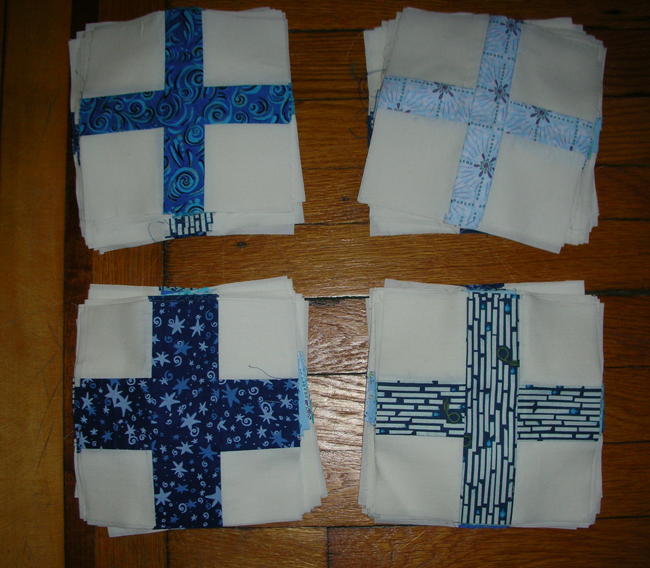 I made up blocks in five patterns each of light, medium and dark fabrics. The center block in the back row is Kona cotton, because I wanted to add a solid to each group. The one in the back right is from the fat quarter bin at my local fabric store. The other three came from Jo-Ann fabrics sometime in the last four years. 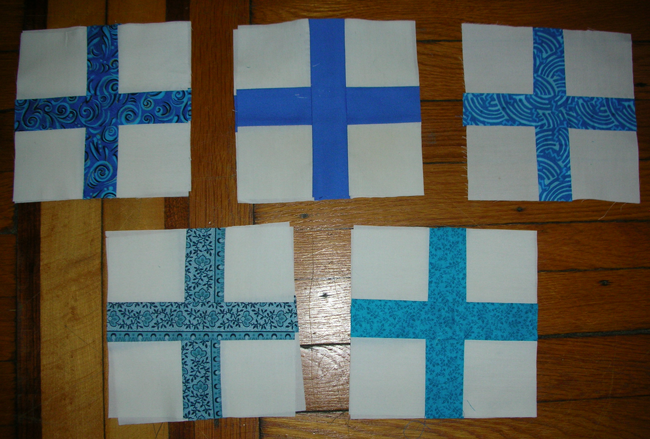 The center top is a Kona cotton solid again, and the bottom left is from the local fat quarter bin. The other three? Same as above. Top right is the Kona cotton solid, which looks black here, but is actually the same deep blue as the Nine-Patch Lattice Quilt I made last month. Bottom right is Illuminate, from Lizzy House’s 1001 Peeps collection. I love the whole collection, so when one of the generic calicos I had for this didn’t work out, I was pleased to be able to pull this one in. In the mean time, I still have to quilt my Nine-Patch Lattice quilt, and I’ve started another quilt for a friend’s son, which will show up next time.